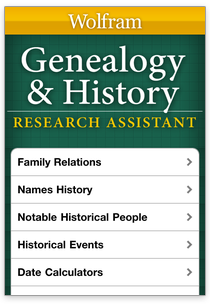 I'm always on the lookout for new tools and websites that can assist me with my genealogy research. I want to let you in on a new find, WolframAlpha, which is a search engine with a twist. I'll bet that most of us as genealogists and family historians are using some of the more standard search engines available including Google, Bing and Yahoo. These sites help us find information and the process has become standard among Internet users: enter your search terms, click on search and then review a list of links to relevant websites. There are times when the answers to our questions aren't waiting for us on a website. Sometimes, those answers need to be computed. That's when WolframAlpha comes in. There are times when I am researching and I just want a question answered. No, not a question like "How do I get a copy of my great-grandmother's birth certificate?" but more like "What is $100 in 1910 worth today?" For me, it is often these questions that help add new dimensions to my own research and help me understand how my ancestors lived. If my great-great grandfather purchased something for $100 in 1910, I'd like to better understand how much of a sacrifice that would have been for him. WolframAlpha allows you to gather this type of information about money as well as weather, dates and names and more. I see WolframAlpha as a more of an answer engine than anything else. It allows me to calculate information based on set input parameters. Great concept, right? What sets this computational knowledge engine apart from other search engines is the ability to pull data from external sources (meaning websites outside of WolframAlpha) that are curated (meaning selected for their data reliability and sources) and then use that data to analyze your research. How Can WolframAlpha Help My Genealogy Research? 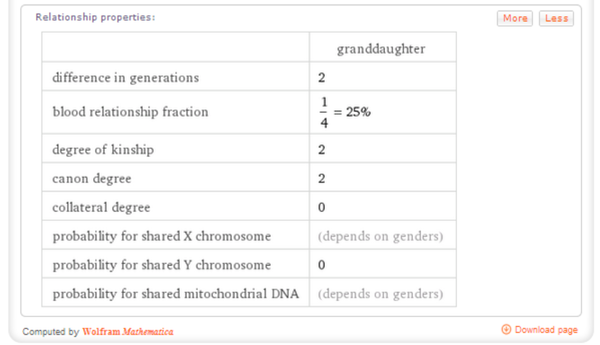 Each of these topics factor into genealogical research and writing and WolframAlpha provides solutions to questions such as "How am I related to my great-grandmother's niece" or "What was the time of the sunrise on April 1, 1962, in Chicago, Illinois?" The possibilities of how you could incorporate queries on WolframAlpha into your genealogy is nearly endless. While I can't cover all of the different search topics at WolframAlpha related to genealogy and family history here, I'll try to cover the highlights. WolframAlpha can provide information about different types of family relationships as well as compute family relationships and present valuable information for genealogists and family historians. 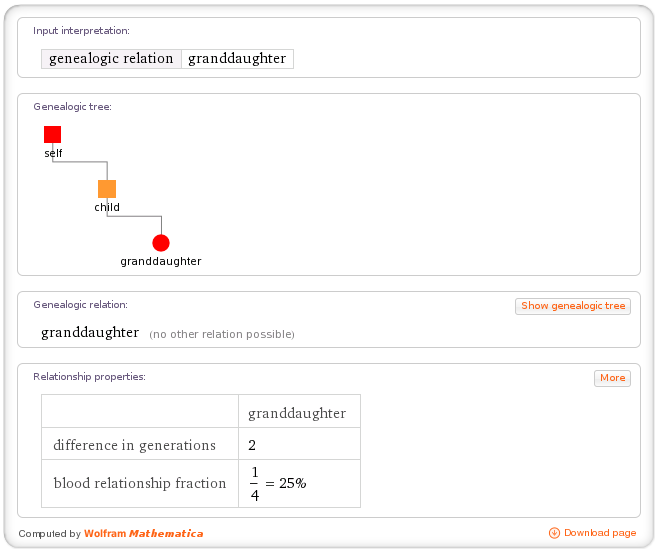 If you want to understand not only the meaning of a family relationship, but also a visual depiction through a family tree and detailed relationship properties, WolframAlpha can provide much more information than genealogy database software. For example, type granddaughter in the search field and click the equal sign. Basic information about the relationship appears including a genealogic tree, a genealogic relation, and relationship properties including difference in generations and blood relationship fraction. Relationship properties: Expanded relationship properties include degree of kinship, canon degree and DNA-related calculations. You can find a list of Relationship calculation examples to test at WolframAlpha here. 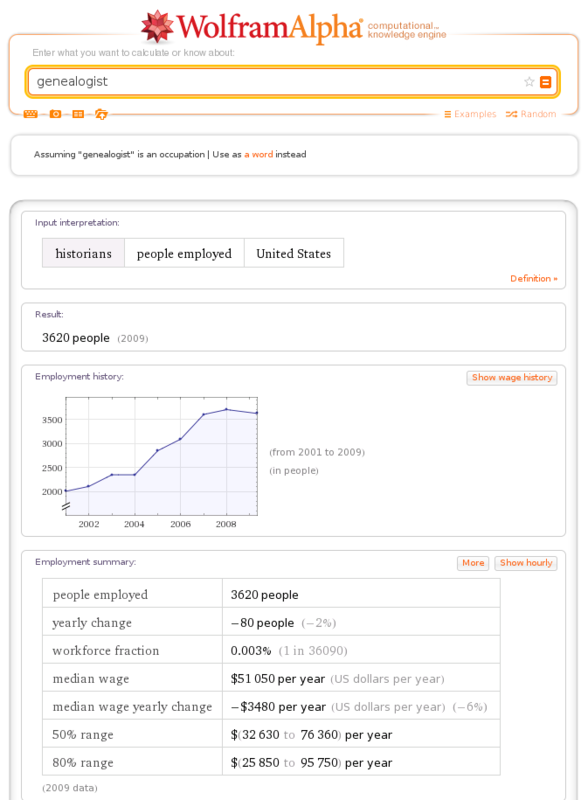 WolframAlpha can be used to look up information on almost any profession, including genealogist. The data found for the genealogist position includes employment history (number of people employed each year), wage history, median wage, related occupations, and the Standard Occupational Classification (SOC) code. What's the speed of an unladen swallow? What was 20 dollars' worth the year your great-grandmother was born? Could you get the same answers by just using the WolframAlpha website? Yes, but for some researchers, the WolframAlpha app gathers all the needed tools for research in one convenient area. Once you have mastered the sections of WolframAlpha most important to genealogists, you'll wonder why more of your research colleagues haven't heard about this amazing solutions platform. WolframAlpha® is a registered trademark of WolframAlpha LLC - A Wolfram Research Company.